Dada Robotnik: Cratelung Taking off! 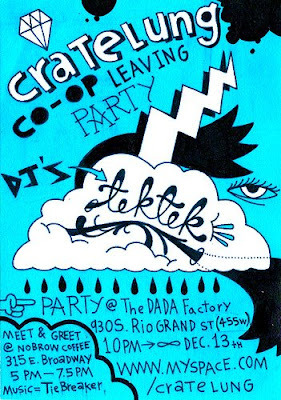 We at The Dada Factory are hosting Cratelung's going away party! Cratelung is a local art collective that's leaving on an all-star trip through the Southwest. Their bold and adventurous team includes our dear buddy Casey and a bunch of his friends. Find out more about Cratelung's Tour. Join the party's Facebook Page. Sadly, I will be in New York on the 13th, so go for me and take pictures!